1 skein of Lion Brand Collection Super-wash Merino DK. 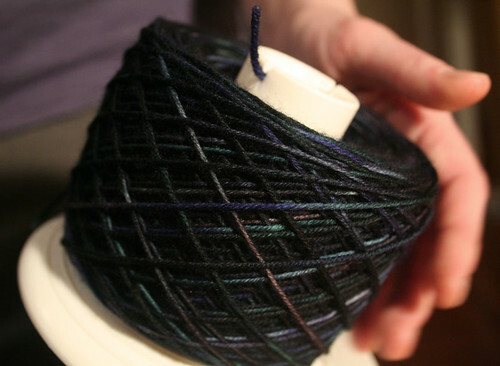 I used my yarn swift at its biggest setting to unwind the skein of yarn into a BIG hank. Dyed using Jacquard Acid Dyes; Sage (green) & Perwinkle (blue) & 6 packets of Grape Koolaid. I used these instructions from Dhartma Trading. It was so easy, and I am so delighted with my results that I know I will be dying and over dying yarn again. oh it looks so pretty!! Wow that's really beautiful. What was the color of the LB Superwash that you started with? I used the off/white color LB Superwash. I have another skein in the light denim that I might over dye as well. It takes acid dye like a dream!